Movies, TV shows, video games, and other media often feature iconic weapons with eye-catching appearances. 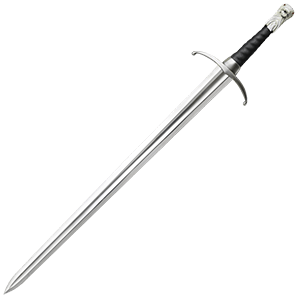 Here at Buying a Sword, we carry a variety of movie weapons and various licensed weapon replicas from popular franchises like the Lord of the Rings, the Hobbit, Vikings, Conan the Barbarian, Game of Thrones, the Legend of Zelda, the Walking Dead, 300, and Assassins Creed. These collectible weapons include pieces like Sting replicas, Ragnar Lothbroks axe, the Arakh of Khal Drogo, Altair daggers, and many more. In addition to steel weapons replicas, we also include several LARP weapons perfect for roleplaying as your favorite characters. Some of our pieces at Buying a Sword are limited edition replicas, so make sure to grab your favorites before they are gone! The Assassins Creed video games in the bestselling franchise illustrate the encounters between two feuding ancient secret societies, the Assassins and the Knights Templar. Abstergo Industries, the modern face of the Templars, kidnaps assassin Desmond Miles in an effort to gain the locations of various artifacts from his ancestral memories. By using the Animus to access his memories, Desmond explores the lives of past assassins like Altair Ibn-La Ahad, Ezio Auditore da Firenze, and others, all the while attempting to recover the artifacts before Abstergo does. Buying a Sword is proud to offer several licensed Assassins Creed weapons inspired by these action-adventure games as well as the Assassins Creed film. We carry everything from Assassins Creed throwing knives to Assassins Creed swords, giving you plenty of options to enjoy. Our Assassins Creed weapon replicas make excellent display pieces, collectibles, and accessories for cosplay. Be sure to take one of our Legend of Zelda weapons with you as you head off on your own adventure. After all, it is dangerous to go alone! 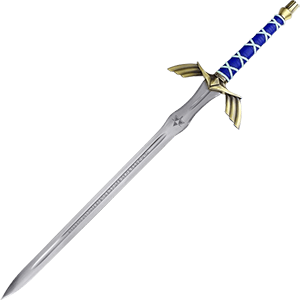 Buying a Sword is proud to offer excellent Zelda weapon replicas including several versions of the iconic Master sword and Heros sword in blue, black, and white colors. We carry a variety of Zelda swords made from steel, as well as wooden sword versions. Our Zelda daggers offer another option for fans to enjoy. Additionally, our selection includes Legend of Zelda LARP weapons, including fantastic foam latex swords that you can use to roleplay Link as he heads off to rescue the princess. Several of our decorative Zelda swords come with a display plaque for hanging your collectible sword on a wall, though these Zelda blades work equally well as costume swords for reenactments! The Lord of the Rings films, based on the classic tale by J.R.R. 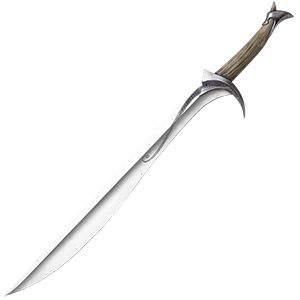 Tolkien, feature many iconic weapons wielded by characters like Frodo, Gandalf, Legolas, Sauron, the Nazgul, and Aragorn, among others. The licensed weapon replicas that we carry here at Buying a Sword are modeled after the actual movie props used in The Fellowship of the Ring, The Two Towers, and The Return of the King. We also carry replica weapons based on those seen in The Hobbit film trilogy. 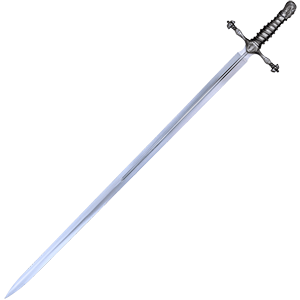 Our selection includes unforgettable swords like Sting, Glamdring, Anduril, and the Morgul blade, as well as other weapons like Gandalfs staff, Filis warhammer, and Orcrist. In addition to steel weapons, we offer an assortment of excellent Lord of the Rings LARP weapons that are perfect for roleplaying or cosplaying as your favorite halfling, Uruk-hai, or wizard. 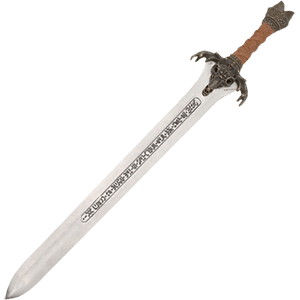 Browse through our selection of Lord of the Rings and The Hobbit replicas to find the perfect collectible weapon to show off to all your friends! Inspired by the saga of Ragnar Lothbrok, the Vikings TV show on the History Channel recounts the origins and rise of this legendary Norse hero. Ragnar begins his tale as an ambitious farmer, but he quickly ascends in power as he leads raiding parties along the shores of England. With the licensed Vikings weapons available here at Buying a Sword, you can now enjoy your favorite historical drama in a whole new way. These Vikings weapon replicas include the iconic axe of Ragnar Lothbrok, which makes a stunning wall hanging that you can put on display in your home. 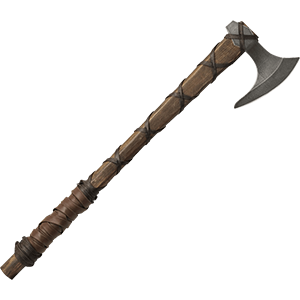 Certain official Vikings weapons are limited edition, so you should be sure to pick yours up while they last. Check back regularly to see newly added Vikings collectible weapons that you can show off to your friends! The Walking Dead tells the story of a group of people who have survived the initial zombie apocalypse and now strive to live through the new dangers of their world. Fans of the hit AMC series can now make their own preparations for the undead by collecting our licensed Walking Dead weapons! 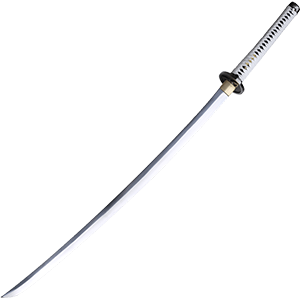 Our Walking Dead replicas include pieces based on TV props from the show, such as Michonnes katana. Crafted from high carbon steel, this Walking Dead sword can easily serve as a unique decorative sword in your home decor with its biohazard markings and matching scabbard. No matter whether you prefer the TV show or the comic books it was based on, these Walking Dead collectible weapons make fantastic options for showing your love of the story!